Are You Ready To Go Viral, Increase Awareness, Traffic & Profits For Your Business? You’ll Learn Exactly What You Need To Know About Starting Your Own Viral Marketing Crash Course To Increase Awareness And Profits For Your Business! Inside each lesson, you will receive easy to understand information that you can use to help you effectively start your own viral marketing campaign and use it to get more traffic, increase awareness and rake in more profits than you ever imagined. This course is specifically designed with beginners in mind, so even if you’ve never heard of viral marketing you’ll be able to quickly grasp the concept and start your own campaign fast! Why it’s important to create a buzz before your new product even hits the market! And that’s just the beginning. 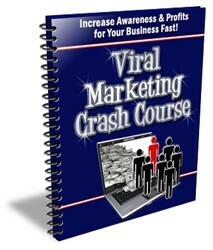 Once you sign up for the “Viral Marketing Crash Course” you will have access to great information in every lesson that will help you learn how to effectively start your own successful viral marketing campaign and use it to get more traffic, increase awareness and profits for your business fast! start receiving your crash course lessons right away!